2013 Crown Royale Football. Only 299 produced. sorry for any inconvience. Over 100,000,000 served. 2013 Fleer Retro Football. Only 50 produced. FREE scheduling, supersized images. Very nice card. Please see pictures for a great look at card. Card will be shipped top loader protected inside a standard envelope. Shipping to a United States address is $.99. I will ship internationally using the ebay global shipping program. If you have any questions please feel free to ask. Thanks for your interest and take care. DON'T MISS OUT ON THIS RARE CARD! 2013 Panini Spectra Football. Autograph trading card. Only 25 produced. FREE scheduling, supersized images. Justin hunter auto! Must have for collectors and fans! Free shipping, message me for questions! Thanks for looking! JUSTIN HUNTER. Only 99 of this card were signed by Hunter; this one is serial-numbered #65/99. Card is in MINT condition, and best of all, it is signed by Hunter directly. 2013 Press Pass. ON THE CARD, not on a sticker or hologram! For Sale: You get the card listed in the title If there are multiple cards in the scan you get the one listed in the title. Cards Are Considered nr. Mint - Mint or Better. 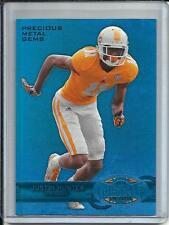 2013 Certified Totally Gold Rare #23/25 Justin Hunter see pics! It is being sold as-is. This is an actual scan of the card you are purchasing. Mint Condition 2013 Score Justin Hunter and Arthur Brown Rookie Cards. This is card number 216 in the set and is numbered 105/299. Don't miss this great chance to own a piece of NFL history. 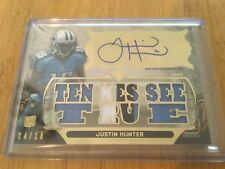 This is for a 2013 UD SPx Rc WINNING BIG MATERIALS JERSEY # WB-HU JUSTIN HUNTER Rc. LOT # A489. 379 Chance Warmack RC. If you win more than 1 different item, wait for my invoice! Lot Contains 249 Justin Hunter RC. GOOD LUCK! The item must be in the condition that it was received. This is for a 2013 Panini Certified ROOKIE JEREY / AUTO # 316 JUSTIN HUNTER Rc. Card is serial #'rd 068/399. Card is in great condition with sharp corners, smooth edges & good centering both front and back. NiceBOLD on-card autograph! Card number is IEA-JH and numbered 11/25. 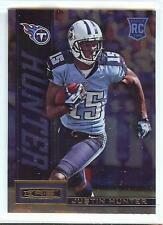 2013 Donruss Elite #10 Justin Hunter 97/99 Titans Event Material Rookie Card! JUSTIN HUNTER. 1 - SCORE (GREEN)#383.